Police say no substa­nce to blasph­emy allega­tions, but tellin­g pastor to flee was only way to avoid violen­ce. 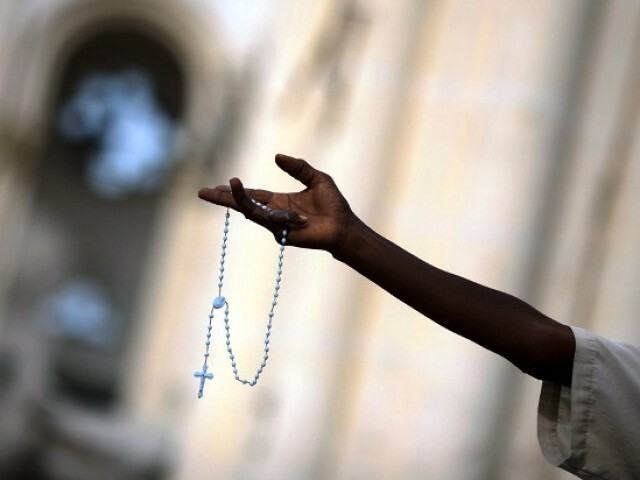 A pastor has been forced to abandon his house and flee in order to escape blasphemy charges after some of his parishioners accused him of defiling the Bible. The pastor denied the blasphemy charges and maintained that they were concocted by a local Christian family which bore a grudge against him. The police investigator in the case supported his claim, though he said that he had instructed the pastor to apologise and to flee his post at the church as local Christians had been whipped up into a murderous frenzy. Asghar Nizam Ranjha was appointed the pastor of the church in Ferozewala, Sheikhupura district, by the Salvation Army and served for about a year. On January 19, an application was filed with the DPO seeking an FIR against him for allegedly defiling the Bible in the church. The application was forwarded to Ferozewala police station and Sub Inspector Nawaz summoned Ranjha and his accusers some eight days ago. Ranjha told The Express Tribune that SI Nawaz advised him to apologise and leave the area immediately, else his life was in danger. A baying mob had gathered outside the police station. “The SI told me that if I did not apologise, he would have to register a blasphemy case against me. He said my only option was to apologise and leave, so I apologised,” he said. His wife and four children joined him later. Ranjha said that he was still hoping for a chance to go back to the rented house in Hakeempura, Kala Shah Kaku, and collect the family’s belongings. The Salvation Army, meanwhile, has transferred him to Sahiwal. Ranjha said that he sought to put a stop to this, which was why they had developed a grudge against him. They complained four times over the course of the year to the Salvation Army to try and get him transferred, but in vain. “They then used the blasphemy charge to get me to leave,” he added. SI Nawaz, talking to The Express Tribune, said that he believed there was no substance to the blasphemy allegation. “The pastor is a bit harsh in his manner, but I don’t think he defiled the Bible,” he said. The complainant, Mushtaq Masih, said that he had many objections against Ranjha. He said that there were four churches in the area and Ranjha never mingled with the pastors of the other churches. He said that he was also very arrogant. Asked about the blasphemy allegations, Masih would neither confirm nor deny them, saying he did not want to talk about them over the phone. “One thing is certain. He (Ranjha) must never return to the area, otherwise he himself will be to blame for any harm that comes to him,” he said. Published in The Express Tribune, February 25th, 2013. Just the accusation of blasphemy triggers a reaction so frenzied that even authorities fall into the trap. The petitioner accuses the ambassador of blaspheming on a programme two years ago. Policeman appears on court notice to explain why he did not file a case. Dr Iftikhar is said to be a PhD scholar who has authored several books on different topics. Case registered against 222 people; 10 injured in scuffle. Come on Christians, you got to be kidding me. There is enough of Pakistani Mullah’s extremism spread around the country which we all have to bear and now you guys want your way of extremism get into the mix. Please Catholic and Anglican leaders get together and sort out this issue out of court. Like Ahmadis Christians have heavily suffered at the hands of Blasphemy laws. They must not use these against each other. Hopefully this is the first and last of such thing I’ll hear from my Christian friends. In the eyes of God all humans are same. In the eyes of Pakistani law all Pakistanis are blasphemers especially if they have property that can be mulcted. I had always thought that blasphemy laws apply only if Islam is disrespected. It does not appear so. Hmmm..so its not just Muslims who do this sort of thing. But it appears that both the middle eastern abrahamic faiths are big on blasphemy. Diffusion of extremism .. welcome to Pakistan. Since Pakistan believes in ‘two nation theory’ it should split into two. One country for Sunni Muslims and another for Shias, Christians, Hindus, Sikhs etc. For havens sake At least avoid printing his home address. When you will learn how to report. This reporting is playing same fear for minorities. Please let people live. They are responsible for their deeds and grave not us. Let them live peacefully with their families. Ms Abullah , Pervar Hoodbye and other champions of human rights where are you now? Come up and save a human soul from the horrors of Blasphemy. Perhaps you will act only when Muslims are to be blamed (whether right or wrong).